Ettore Sottsass (14 September 1917 – 31 December 2007) was an Italian architect and designer of the late 20th century. His body of designs included furniture, jewelry, glass, lighting and office machine design. He founded the Memphis Group and flirted with the Situationist International for a (very) short time. He was also connected to the radical design movement and was part of an iconoclastic generation of Italian designers that included Luigi Colani, Alessandro Mendini, Gae Aulenti and Joe Colombo. His best-known product is the Olivetti Valentine typewriter. His 1981 "Carlton Cabinet" was to many people their first de facto exposure to postmodernism. Sottsass was born on 14 September 1917 in Innsbruck, Austria, and grew up in Milan, where his father was an architect. He was educated at the Politecnico di Torino in Turin and graduated in 1939 with a degree in architecture. He served in the Italian military and spent much of World War II in a concentration camp in Yugoslavia. After returning home in 1947, he set up his own architectural and industrial design studio in Milan. In 1959 Ettore Sottsass began working as a design consultant for Olivetti, designing office equipment, typewriters and furniture. Sottsass was hired by Adriano Olivetti, the founder, to work alongside his son, Roberto. There Sottsass made his name as a designer who, through colour, form and styling, managed to bring office equipment into the realm of popular culture. Sottsass, Mario Tchou, and Roberto Olivetti won the prestigious 1959 Compasso d’Oro with the Elea 9003, the first Italian mainframe computer. 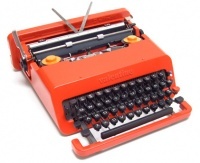 Throughout the 1960s, Sottsass traveled in the US and India and designed more products for Olivetti, culminating in the bright red plastic portable Valentine typewriter in 1969, which became a fashion accessory. Sotsass described the Valentine as "a brio among typewriters." Compared with the typical drab typewriters of the day, the Valentine was more of a design statement item than an office machine. I didn’t want to do any more consumerist products, because it was clear that the consumerist attitude was quite dangerous. The feeling that his creativity was being stifled by corporate work is documented in his 1973 essay "When I was a Very Small Boy". As a result, his work from the late 60s to the 70s was defined by experimental collaborations with younger designers such as Superstudio and Archizoom, and association with the Radical movement, culminating in the foundation of Memphis at the turn of the decade. In 1981, Sottsass and an international group of young architects and designers came together to form the Memphis Group. A night of drinking and listening to Bob Dylan's "Stuck Inside of Mobile with the Memphis Blues Again" gave the group its name. Memphis was launched with a collection of 40 pieces of furniture, ceramics, lighting, glass and textiles which featured fluorescent colors, slick surfaces, intentionally lop-sided shapes and squiggly laminate patterns. The group's colorful, ironic pieces were hailed as one of the most characteristic examples of Post-modernism in design and the arts. Sottsass described Memphis in a 1986 Chicago Tribune article: "Memphis is like a very strong drug. You cannot take too much. I don't think anyone should put only Memphis around: It's like eating only cake." Sottsass Associati, primarily an architectural practice, also designed elaborate stores and showrooms for Esprit, identities for Alessi, exhibitions, interiors, consumer electronics in Japan and furniture of all kinds. The studio was based on the cultural guidance of Ettore Sottsass and the work conducted by its many young associates, who often left to open their own studios. Sottsass Associati is presently based in London and Milan and continue to sustain the work, philosophy and culture of the studio. As an industrial designer, his clients included Fiorucci, Esprit, the Italian furniture company Poltronova, Knoll International, Serafino Zani, Alessi and Brondi. As an architect, he designed the Mayer-Schwarz Gallery on Rodeo Drive in Beverly Hills, California, with its dramatic doorway made of irregular folds and jagged angles, and the home of David M. Kelley, designer of Apple's first computer mouse, in Woodside, California. In the mid-1990s he designed the sculpture garden and entry gates of the W. Keith and Janet Kellogg Gallery at the campus of Cal Poly Pomona. He collaborated with well known figures in the architecture and design field, including Aldo Cibic, James Irvine, Matteo Thun. Sottsass had a vast body of work; furniture, jewellery, ceramics, glass, silver work, lighting, office machine design and buildings which inspired generations of architects and designers. In 2006 the Los Angeles County Museum of Art held the first major museum survey exhibition of his work in the United States. A retrospective exhibition, Ettore Sottsass: Work in Progress, was held at the Design Museum in London in 2007. In 2009, the Marres Centre for Contemporary Culture in Maastricht presented a re-construction of a Sottsass' exhibition 'Miljö för en ny planet' (Landscape for a new planet), which took place in the National Museum in Stockholm in 1969. One of his works, Telefono Enorme designed for Brondi, is part of the MOMA Collection. Personal computer M 24 per OLivetti (1984). Nomina a Grande Ufficiale per l’Ordine al Merito della Repubblica conferita dal Presidente della Repubblica Italiana nel 2001. Unless indicated otherwise, the text in this article is either based on Wikipedia article "Ettore Sottsass" or another language Wikipedia page thereof used under the terms of the GNU Free Documentation License; or on original research by Jahsonic and friends. See Art and Popular Culture's copyright notice. This page was last modified 13:54, 10 October 2017.